But they really are the sweetest kinds of lemons. :) This is Stella and her little boy Pavlov. Most of my Blogging friends know them by now. 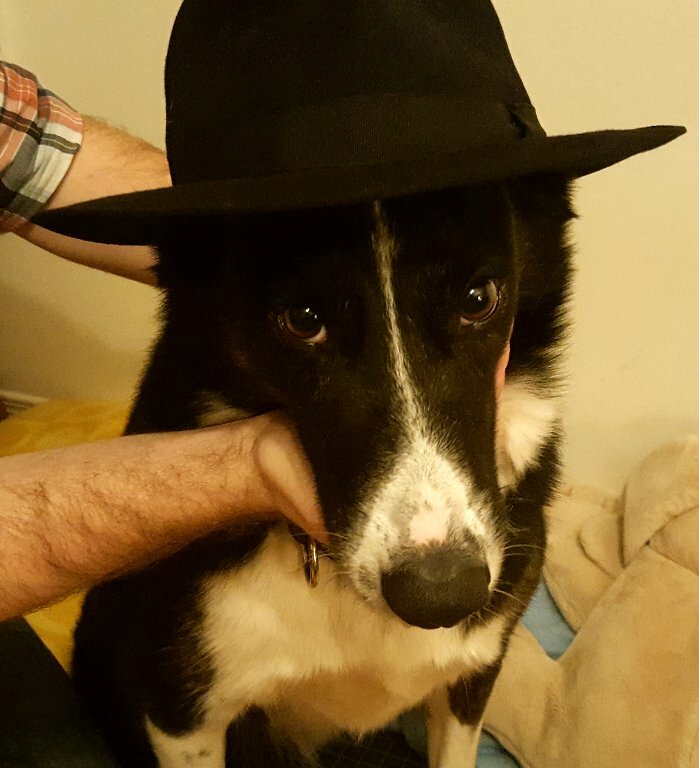 We have a friend who had to leave the country for his father's funeral. He was supposed to be back Monday. Long story very short, he may not be back at all. It's complicated and very emotional, very worrisome due to finances...and really? How can we really stay sane with five dogs and three cats in our rental? 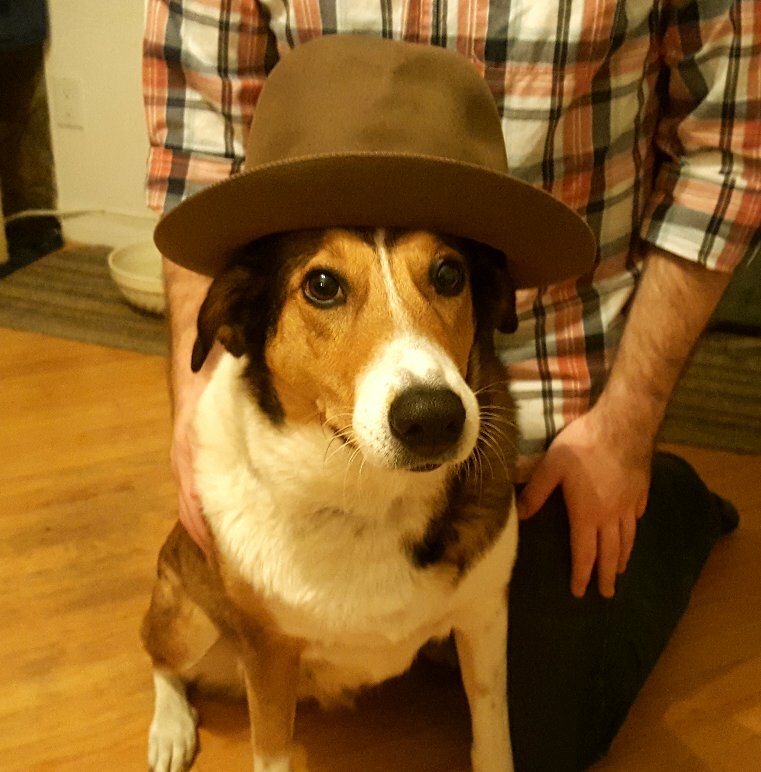 I always take pictures of my little Jack-rabbit in a hat, so we had a little fun last night! Caring for so many animals is challenging. I've really missed my regular blogging and my hobbies. I know there is a way to get back to our routine...I just haven't found it yet. 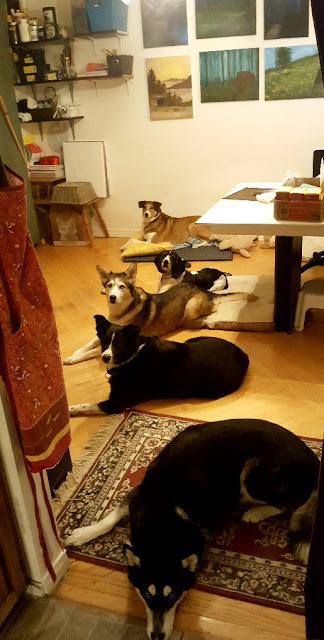 Waiting for dinner, as they all "take their place". We finally got all five of them to stay put while we get their dinners going! 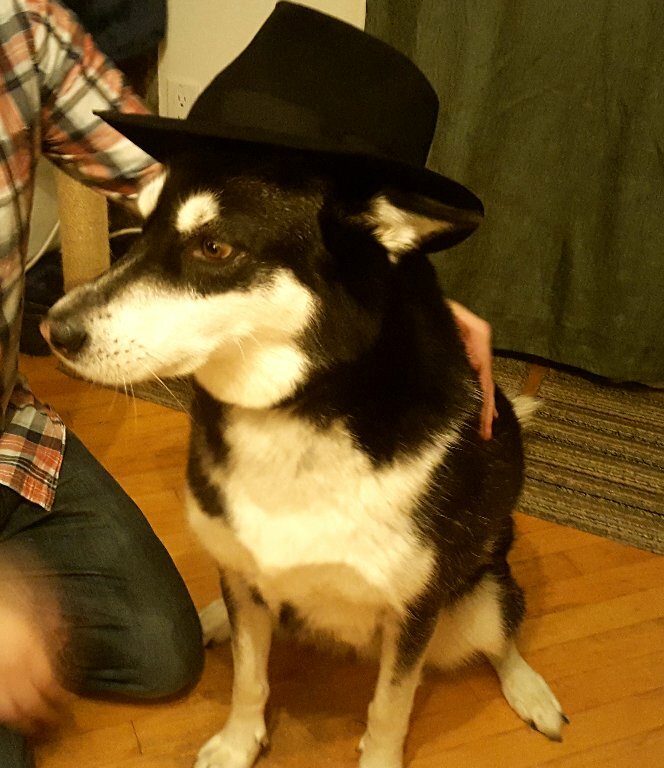 They are all very smart pooches! I feel like I'm neglecting the poor cats these days, the dogs take up so much of my time, energy and focus. I did find time to can 38 jars of tomatoes though! FINALLY the tomatoes were a good price, so late in the season. I am currently working on 40 pounds of apples for apple sauce. I'm really enjoying the canning process! 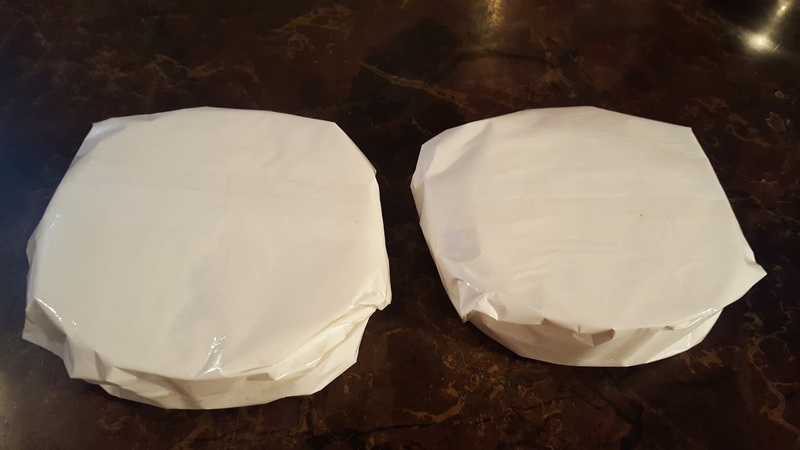 I've wrapped my Camemberts and they are now aging for another month and a half. 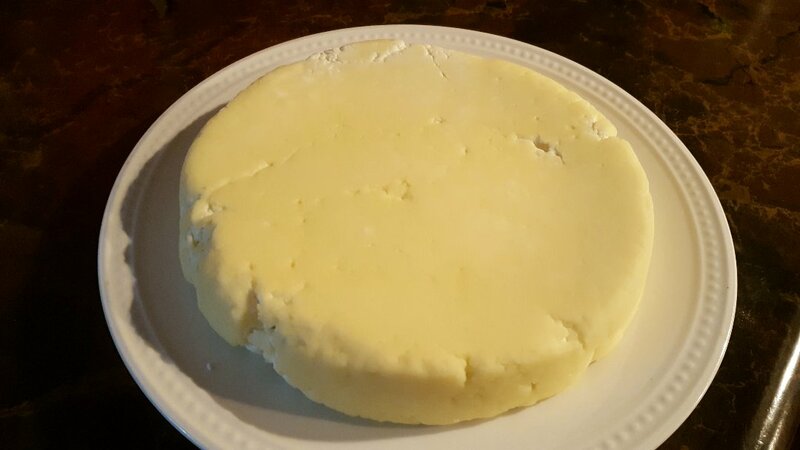 I started a "Baby Swiss" cheese too. The "baby" just means it ages less than a Swiss! Actually if I want to be all proper and legal, it's an "Alpine" cheese. I didn't make it in Switzerland so I shouldn't really call it a Swiss. I guess it's like trying to call a sparkling wine made anywhere other than the Champagne region of France a champagne! I don't think the cheese police are monitoring me...so I'll call it a Swiss lol. This will be ready in early 2018. Check out the "cheese cave"!! 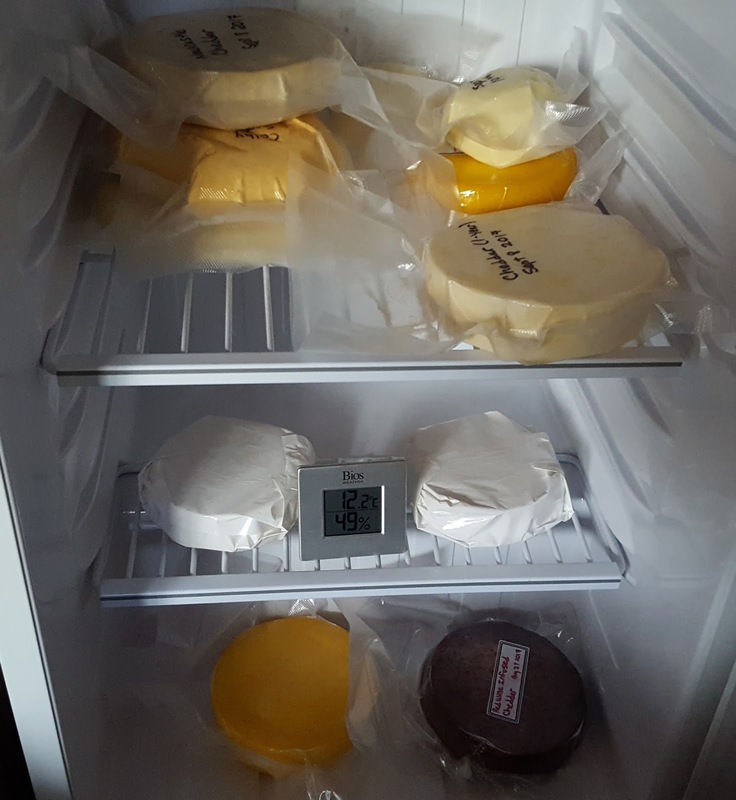 Minus the Swiss, I have 10 cheeses aging! The Colby and Dry Jack will be ready to try in the next few weeks...and my first Cheddar on Halloween! 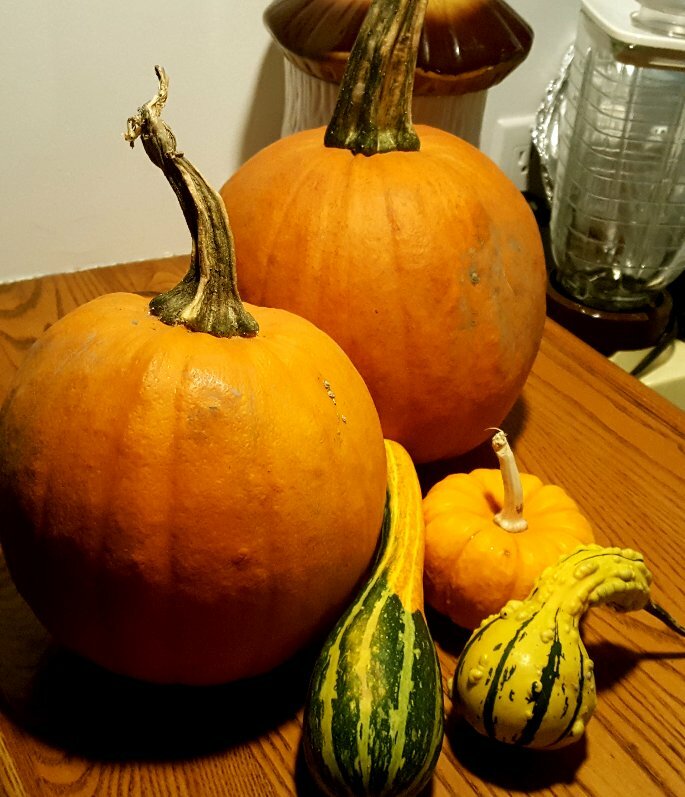 To cheer myself up I went to the market this morning and got some little pumpkins and decorative gourds. Monday is our Thanksgiving and I have a massive dinner planned for Alex and me and our eight fur-kids lol...insanity. Wonderful photos and very delightful. Wish you all the best, warm greetings! Have a wonderful Thanksgiving! It's lovely to see the pumpkins out. i am sending you an email....i am soo happy that somehow, you are all doing well! Great job on the tomatoes, they will be good in soup this winter. 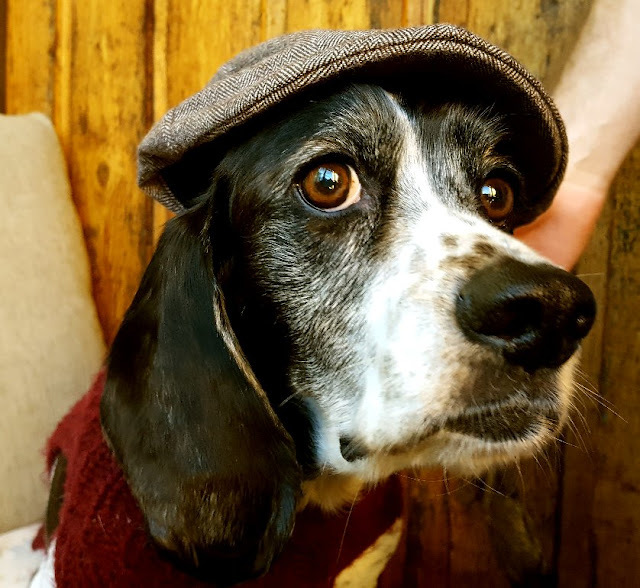 Maybe you can find a home for the doggies they look like nice ones. We will always be here so don't stress about not being here time to time. Take care of business and that will make you feel better. Oh Rain, I really do feel for you. I know how hard it is dealing with unexpected fur-babies! 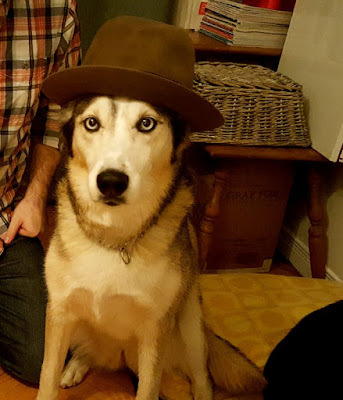 We had hoped ours would all get along, but I've only hinted at it in my blog about Echo, because I'm sure my BF or his family may read it. However, she has to be rehomed because she so badly attacked my dog that she nearly killed him. It's broken our hearts but we just can't have that kind of uncertainty in a place where people will come to stay. Saying that, I seem to have suddenly attracted the local cats and found myself today with only enough cat food to last the weekend! Thank goodness for my emmergency supplies! The new cat eats as much as all my others put together!!! It is hard to say no to a friend in need and also difficult to look into those sad dogs eyes and not want to help. You are a good soul. Aw, that is really sweet that you are keeping them! It is a lot of work but if anyone can find a way to make it work, it's the two of you. Those furry faces...how can you resist? They are beautiful. Your canning! Wow...that is quite impressive. I've been wondering about that lately. Now that the kids are grown and moved out, and my husband and I have decided to retire early, I have time for stuff like this. And since I enjoy home cooking and homemade food, canning makes sense. I'll have to read up on it. In the meantime, I freeze all kinds of things like chopped veggies and applesauce and meals and soups and desserts and tomato paste cubes and on and on. Buying things when they're on sale and preparing and freezing them is a great way to stretch the budget. Don't worry about blogging and all that. Take your time and get into a comfortable and manageable routine. We'll be here! And if you want to do an email exchange to keep in touch, I'd be happy to do that, too. Just let me know. No pressure! I can understand your determination not to let the dogs fall into the "no owner" twilight zone. My daughter is a great animal lover and has rescued many different creatures, but she lives in an apartment too. Over the years, all of my ferrets have been rescues she brought here, and we've had silkie chickens a friend decided she didn't want and was going to abandon, two giant white chickens she raised in her apartment from chicks. She found them in a pet store just before they were sold as snake food. We've had numerous cats, and she will be leaving her pet squirrel and her horse with us when she moves from Cincinnati to Jacksonville, Florida. It can be tough fitting everybody in, but I've always found that you get some much back from the animals in return. You have such a great attitude. Baby swiss? That is one of my favorite. Yum! So sad to hear the dog's owner can't keep them, but glad they are in a very good home. Thanks Christine :) Happy Thanksgiving to you too! Thanks Gill :) I really enjoyed canning the tomatoes! And the apples went well too. 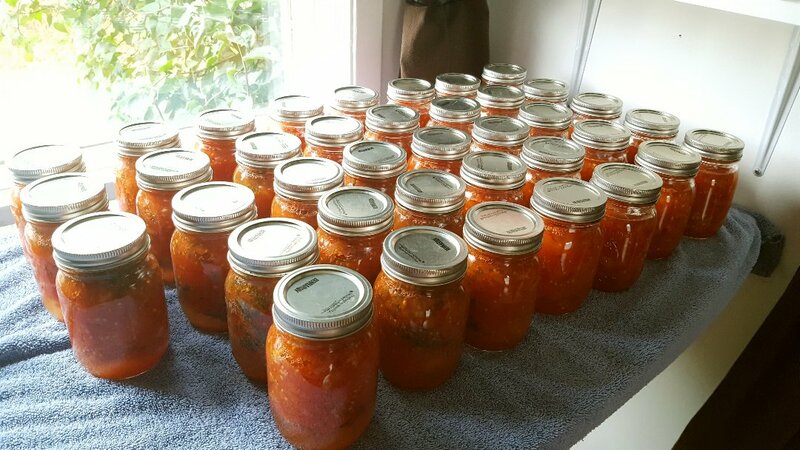 I think that I might just buy tomatoes for canning from now on. Not worth all the work to plant so many and it costs less to get them at the market. As long as I know they are local and not loaded with pesticides. They really are sweet dogs. We're still a bit up in the air about the situation, but it looks like we'll be keeping them after all. Hi Starting Over :) Thank you so much. When he called us two weeks ago, it was around 5pm, and we were in Montreal 3 hours later picking up his dogs. It was so fast, we just couldn't say no. It was overwhelming at first, but we're starting to all settle down, thankfully! I think you should DEFINITELY get into canning! Do you have a good market nearby where you can buy in bulk? We're lucky we do. 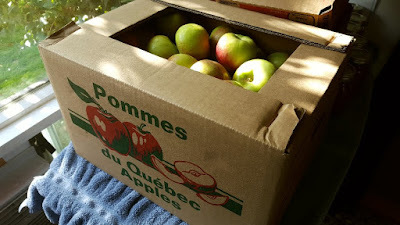 I got that 40-pound box of apples for $26. We give the dogs apple sauce with their food, to hide the pills and supplements, and canning my own comes out to way cheaper than buying the organic jars. Plus I love seeing hundreds of full Mason jars!! :) I started out with a water-bath canner which you use for fruit. I'm hoping one day to get a pressure canner so I can do veggies and meats too. If you do get a canner, be wary of Canadian Tire's selection. We got one there and it was way too small for the jars to be covered with water. Also the rack was so crappy that the jars kept falling out the sides. We ended up having to return it and get one at Amazon. Alex said in our new place he's going to build me a proper "jar" pantry. I really wish I could can more stuff, but we just have no room here! Btw, I have a doo-hicky on my side bar where you can send me an email, I'd love to correspond that way too! :) Happy Thanksgiving!! Hi Kristina :) Yup! Baby Swiss! 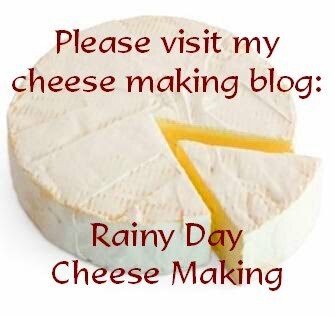 It's drying out in the cheese cave now and should be ready sometime in March of next year! :) And thank you, the dogs are in a very good home. When I was a kid I always thought about opening a dog shelter...careful what you wish for huh lol? No, it's okay though, they are good dogs and so far things are getting better really quickly so we're very relieved! haha....they look adorable sporting their hats. Happy day after Thanksgiving! I was out of reach since Thursday so now am catching up. Oh my goodness..it will all work out! I hope everything settles into a routine for you all! Thanks Pam :) They make good models, though you wouldn't believe how many photos were taken to get just those shots lol! 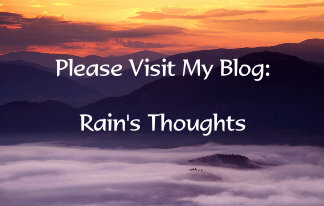 I can't believe you are back blogging and I was missing it! Time goes so fast for me it's scary! Love the pictures of your pooches and so sorry to hear your friend isn't coming back. I know you love those 2 but the time and expense is what weighs on a person. After my pets go there will be no more as I get older I need the money for my meds! LOL! I figures what I spend a month on mine and it is way over $100.00 and yours are all big ones too that eat more! LOL! You and Alex are saviors and those angel dogs know it! It always seems that those with the least in our world give the most. Bless you both!